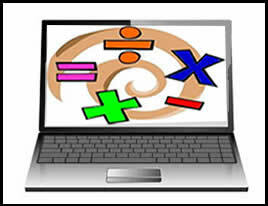 The flexibility of virtual manipulatives and interactive math tutorials can provide opportunities for all students to master math.. Here are 3 interactive sites that work well with students working on their own computers, projected in front of the class, or on an interactive board. This is a very nice interactive site for modeling and solving real-world math problems, designed for elementary and middles school students by Colleen King. The site uses a series of interactive templates to provide guided instruction through tutorials that model the step-by-step process of solving a problem. Then it provides students with independent practice that also walks them through the process and provides them with immediate feedback and progress checking options. Content includes addition, multiplication, factions and ratios, but there is also a modeling tool for teachers to create their own problems. This a library of colorful and interactive web-based virtual manipulatives and tutorials for teaching math. The award-winning project, developed by the National Science Foundation, is research based and designed to use a virtual learning environment to actively engage students in math and help them visualize relationships and applications. The wide variety of manipulative is impressive and activities are available for teaching math in grades PreK-12. This animated, interactive online math dictionary for students, developed by Jenny Eather, explains over 600 common mathematical terms and math words in simple language. It’s colorful, interactive and kid-friendly. This tool might be especially useful for parents to use as a reference supporting students at home.